According to the explicit declaration of this verse, the Prophet Muhammad (Peace be Upon Him) did not know how to read and write. Neither did he write a letter nor did he read a letter. While this is the fact, then, how did he inform about the Pharaoh who had lived ages ago before him and his drowning in the sea? Let us put the answer of how did he informs off and search the answer to the following question: Did Pharaoh really die by being drowned in the water? 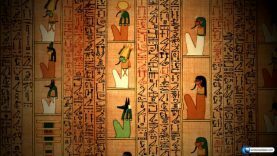 Has this news of the Qur’an about the end of Pharaoh been approved? Here in this scripture, there is a clear explanation about the Pharaoh that he was drowned in the sea. That is, the 6th Egyptian papyrus approves the news of the Qur’an’. The news of the Qur’an has been approved by historical scriptures. Yes, how could the people who deny the Qur’an to be a word of God explain the miraculous news of the Qur’an that informs us about the drowning of the Pharaoh in the sea and its other news about the unseen? Not accepting this book as a word of God means ignoring the truth and denying the reality. The Qur’an is a book and word of God with the correctness of its news about the unseen.